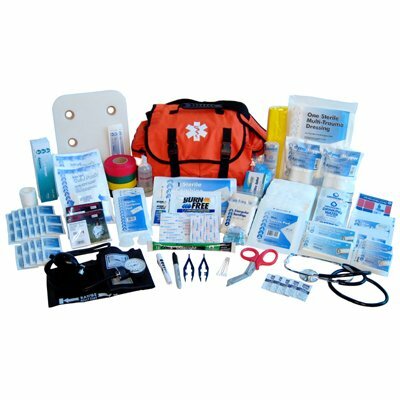 Our "EMT Style" First Responder Kit is a must have for anyone in the field! With contents validated by nurses, EMT's and firefighters, it was created for trained medical responders for any field emergency. 409-Piece Kit Contents: 1 Abdominal Pads Sterile 8" x 7 ½" / 1 Abdominal Pads Sterile 5" x 9" / 1 Multi Trauma Dressing 12" x 30" Sterile / 2 Triangular Bandages w/ Clips 40" / 2 Bloodstopping Compression Bandage 9" x 5 ½" / 50 Gauze Pads 4" x 4" Sterile / 200 Gauze Pads 2" x 2" Non-Sterile / 2 Gauze Rolls 2" Sterile / 2 Gauze Rolls 4" Sterile / 5 Fabric X-Large Knee Bandage 2" x 4 ½" / 25 Fabric Bandage 1" x 3" / 10 Butterfly Bandage Closure Medium / 2 Cloth Adhesive Tape 1" x 10yds. / 1 Disposable Padded Splint 12" / 2 Elastic Bandage 3" x 5yds. / 1 Wire Splint / 1 Medical Tourniquet 18" x 1" Non-Latex / 1 Eye Wash 4oz. / 2 Disposable Eye Cup / 5 Oval Eye Pads Sterile / 3 Non-Latex Nitrile Exam Gloves Pair / 1 Dual Head Stethoscope Classic Style / 1 Blood Pressure Kit Adult Sized Classic Style / 1 Paramedic Shears 7 ½" / 1 Cyalume 12-Hour Green Lightstick / 1 Disposable Penlight w/ Pupil Gauge / 2 Disposable Plastic Tweezers/Forceps / 1 30-Page AMA First Aid & CPR Guide / 2 Tongue Depressors Sterile 6" / 2 Emergency Mylar Blanket 54" x 80" / 1 Paramedic Blanket 54" x 80" / 10 Sanitary Cleansing Towelettes 5" x 7" / 2 Emergency Sterile Water Pouch 4.225oz. / 20 Benzalkonium Antiseptic Wipes / 20 Alcohol Antiseptic Wipes / 5 Triple Antibiotic Ointment Packets / 5 Cotton Tip Applicators 3" / 2 Burn Ointment Packet / 1 Burn Dressing 4" x 4" Pad / 1 Triage Tape 4-Pack (red,black,green & yellow) / 1 CPR Face Shield / 2 Instant Ice Pack 5" x 9" / 1 Sharpie Fine Point Marker Black / 1 Content Card. Packaged in a "Easy Access" Heavy Duty Orange First Responder Bag. This kit includes the contents listed under this item description. If you have any questions about this product by Nexis Preparedness Systems, contact us by completing and submitting the form below. If you are looking for a specif part number, please include it with your message.